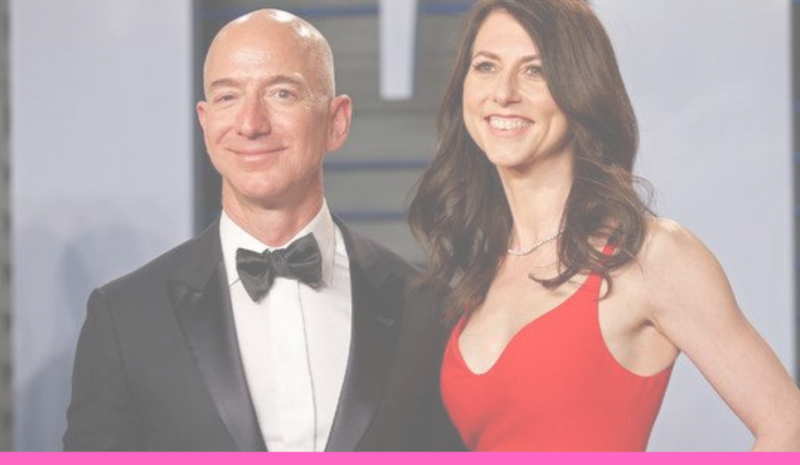 Earlier this month the bombshell news dropped that the world’s richest man, Jeff Bezos and his wife Mackenzie Bezos, were getting a divorce. Headlines of this divorce permeated the news with conjecture around settlement amounts, leaked info of text messages between Jeff and his “love interest” and theories about what actually went wrong in their marriage. I want to explore my top issues with and what we can learn from what will certainly be the most expensive divorce the world’s ever seen. Divorce has become widespread in the last twenty years. It permeates race, wealth, religion, gender, and geography. No one “group” is impervious from the effects of divorce. Even the richest couple in the world. If you’ve ever thought that money could buy you happiness, let this serve as a prime example of why it can’t. Money is just a means to an end. Happiness is derived from things like relationships, experiences, family, fulfillment, etc. Money couldn’t keep the Bezoses, who could buy anything they wanted in the world, from divorce. In the end their money was not as important to them as their happiness. 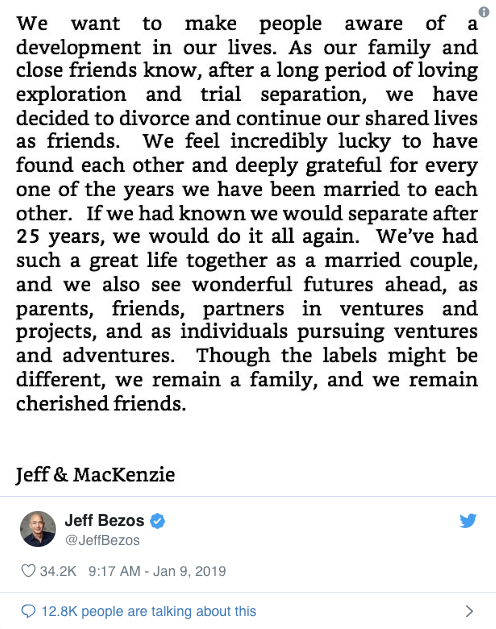 The problem is, after this amicable tweet, we found out about Jeff Bezos’ love interest. We know no-one ever likes being cheated on. And no one ever deems the person who betrayed them as a “cherished friend”. Honesty, maturity, and authenticity go a long way in securing non-toxic divorce. But, you don’t have to cherish your ex-partner. Just don’t be toxic and don’t be nasty. Which leads me to my next point. Certainly billions of dollars could have purchased the right legal representation and the right PR team to “quash” the salacious text messages and the pictures of the “bombshell Latina”. Divorce does not happen in a vacuum. Others are effected. Pay for silence in the interest of your kids. Jeff made comments that he respects the free press and reporters can report. Nonsense. Not when the reports can hurt your innocent kids. Think about the headlines you’ve read regarding this high-profile divorce. They were all about “The World’s Richest Man” or “How Much Will Mackenzie Bezos Receive in Settlement”. 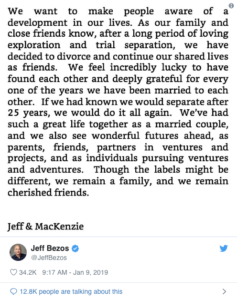 There is something inherently wrong with this idea that the money earned by the Bezoses during their marriage belongs to Jeff. Amazon was founded after their marriage meaning that half the fortune is Mackenzie’s. If Jeff Bezos is the world’s richest man, then doesn’t that make Mackenzie Bezos the world’s richest woman? The headlines don’t reflect this and it’s appalling. This bias stems from the 19th Century, where law actually did consider the assets of a family that of the man. Yes, it’s true that Mackenzie raised her family while Jeff went to work every day, but neither of those responsibilities outweigh the other in importance. Simply put, the world’s richest couple is getting divorced.